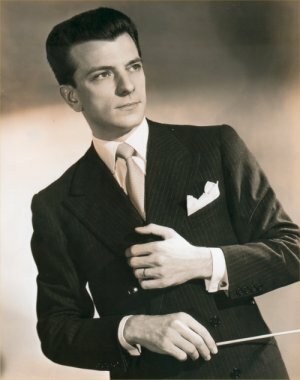 With the death of Guido Cantelli, on the 24th of November, 1956, due to an air-crash at Paris-Orly airport, the musical world lost one of the most promising musicians of the period starting immediately after the end of the WWII, the conductor considered the artistic heir of Toscanini and De Sabata. He had been appointed just one week before (he was only 36 years old) permanent conductor of "La Scala" theatre in Milan. Aristocratic and genial interpreter, Cantelli was born in Novara, on the 27th of April, 1920, second born of Antonio and Angela Riccardone. Extraordinarily gifted for music, Guido was entrusted by his father (conductor of the military band of the 17th regiment of artillery, at that time located in Novara), to Felice Fasola, choirmaster and organist of the S. Gaudenzio Basilica, with his musical education. With him Guido learned the basics of singing, piano and organ playing. Afterwards he continued his studies with M° Paolo Delachi, and eventually was admitted to the Conseratoire "Giuseppe Verdi" in Milan during August, 1939. He was pupil of Arrigo Pedrollo and Giorgio Federico Ghedini for composition, of Antonino Votto for conduction. A few weeks after getting his diploma at the beginning of 1943, Cantelli successfully debuted conducting a repeat performance of "La Traviata" at the Teatro Coccia (21st of February); called to arms, he was compelled to suspend his successful career, just started. After the 8th of September (when Germany, that was a former allied of Italy, became an enemy country), he was sent to a prisoner-of-war camp close to Szczecin, in Poland, not very far from the Baltic Sea. Returned to Italy, he escaped from the sanatorium of Bolzano where he was hospitalized (during the detention he lost weight, at the end it was just 36 kg, about 80 lbs.) and he adventurously reached his hometown, Novara. For several months he remained hidden; after his health recovery, he resumed his work directing some minor operas in the cities of Biella, Novara and Vercelli; such productions helped him to gain experience that will prove to be useful during the future activity. In 1945, immediately after the end of the WWII, he married Iris Bilucaglia and moved to Milan, in Via Livorno, close to the Conservatoire. 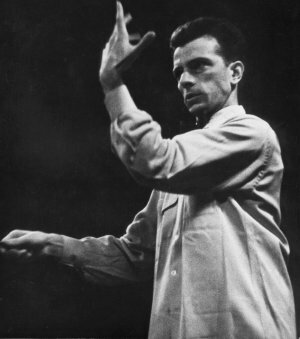 On 27th of July, 1945, Guido Cantelli conducted for the first time the Orchestra of "La Scala" during a concert of the summer season, held at the Castello Sforzesco in Milan. It was another success. He was quickly engaged to conduct a number of orchestras: the Orchestra of Italian Radio (R.A.I.) in Turin, the Orchestra of "La Fenice" in Venice, in Bologna, in Genoa, in Cagliari, the Orchestra of Santa Cecilia in Rome, the Orchestra of "Maggio Musicale" in Florence. In these years he met many promising or already successful musicians, as Arturo Benedetti Michelangeli (who played many times with Guido as conductor, and expressed a flattering opinion about him), Nino Sanzogno, Arrigo Pelliccia, Franco Ferrara, Ferruccio Scaglia, Marcello Abbado, the sicilian pianist and composer Franco Mannino. On 21st of May, 1948, he conducted his first concert inside the newly restored hall of Piermarini (the main concert hall of Teatro "La Scala", Milan), and was immediately discovered by Arturo Toscanini, who wanted Cantelli to conduct his orchestra, the legendary N.B.C. Symphony. Cantelli left for the USA on December, 1948, and had a triumphal debut at the 8H Studio on 15th of January, 1949, with a program including the Haydn’s Symphony n. 93 and Hindemith’s Symphony "Mathis der Maler"; the latter was one among his favourite pieces. After the four concerts with the N.B.C. initially foreseen he was engaged to substitute an ill colleague for the conduction of the Philadelphia Orchestra, getting a good success: since that moment, it was and endless success story. In 1950 he conducted the Orchestra of "La Scala" during the tour in the UK, the first tour abroad after the WWII, and got the enthusiastical appreciation of local audience: "La Scala" was compelled to program a new repeat performance, and the His Master Voice immediately asked him to record Cajkovskij’s 5th Symphony. Since that moment, London was one of his main artistic centres of interest: in 1951 debuted with the Philharmonia Orchestra, founded by the producer of EMI Walter Legge (at that time the Philharmonia was usually conducted by Wilhelm Furtwängler and by a young Herbert Von Karajan), and within the subsequent six years Cantelli recorded with it almost all his records, still considered everlasting classics. At the beginning of 1952 another very important debut, with the New York Philharmonic Orchestra, of which Cantelli became one of the most regular guest conductors. During the years of his international activity he conducted all the most important orchestras of the USA (in particular Charles Münch’s Boston Symphony), and worked with top level soloists (among them Wilhelm Backhaus, Walter Gieseking, Jascha Heifetz, Nathan Milstein, Anton Rubinstein and Rudolf Serkin). In 1956 he returned back to opera with a legendary production of the "Così fan tutte" held at "La Piccola Scala" on 27th of January, 1956, which is considered by many people –one of them is the great soprano Elizabeth Schwarzkopf, who sang Mozart with all the main conductors of that period– as one of the absolute masterpieces of Mozart interpretation of any time. When the experience with the N.B.C. Symphony ended, as Toscanini was retiring due to his age, the birth of Cantelli’s son, Leonardo, and the strengthening of the work with "La Scala" and the Philharmonia were giving new opportunities to his career. A triumphal tour in South Africa (September-October 1956), preceded and followed by several concerts with the Orchestra of "La Scala", lead to his appointment as permanent conductor of the most famous Italian musical institution on 16th of November, 1956. A few days after, on the night between the 23rd and the 24th of November, 1956, Cantelli died together with 32 other passengers in the fire of the plane that was carrying him to the USA, to direct some concerts with the New York Philharmonic. A moved and astonished crowd attended the funeral, held in the church of Santa Maria della Passione, close to the Conservatoire of Milan, while the Orchestra of "La Scala" gave him the last salute by performing the Largo from Händel’s Serse (the last piece conducted by Guido) in front of an empty conductor’s podium. He is buried in the memorial chapel of Novara graveyard.